Beginning in the 1970s and 1980s, the federal government (as well as other governments around the world) began to adopt policies based on the idea that crime could be reduced if you somehow could make it very difficult for criminals to use the money they illegally obtain. So we now have a a bunch of laws and regulations that require financial institutions to spy on their customers in hopes that this will inhibit money laundering. But while the underlying theory may sound reasonable, such laws in practice have been a failure. There’s no evidence that these laws, which impose heavy costs on business and consumers, have produced a reduction in criminal activity. Instead, the only tangible result seems to be more power for government and reduced access to financial services for poor people. And now we have even more evidence that these laws don’t make sense. In a thorough study for the Heritage Foundation, David Burton and Norbert Michel put a price tag on the ridiculous laws, regulations, and mandates that are ostensibly designed to make it hard for crooks to launder cash, but in practice simply undermine legitimate commerce and make it hard for poor people to use banks. Oh, and these rules also are inconsistent with a free society. Here are the principles they say should guide the discussion. The United States Constitution’s Bill of Rights, particularly the Fourth, Fifth, and Ninth Amendments, together with structural federalism and separation of powers protections, is designed to…protect…individual rights. The current financial regulatory framework is inconsistent with these principles. …Financial privacy can allow people to protect their life savings when a government tries to confiscate its citizens’ wealth, whether for political, ethnic, religious, or “merely” economic reasons. Businesses need to protect their private financial information, intellectual property, and trade secrets from competitors in order to remain profitable. Financial privacy is of deep and abiding importance to freedom, and many governments have shown themselves willing to routinely abuse private financial information. And here are the key findings about America’s current regulatory morass, which violates the above principles. The current U.S. framework is overly complex and burdensome… Reform efforts also need to focus on costs versus benefits. The current framework, particularly the anti-money laundering (AML) rules, is clearly not cost-effective. As demonstrated below, the AML regime costs an estimated $4.8 billion to $8 billion annually. Yet, this AML system results in fewer than 700 convictions annually, a proportion of which are simply additional counts against persons charged with other predicate crimes. Thus, each conviction costs approximately $7 million, potentially much more. By the way, the authors note that their calculations represent “a significant underestimate of the actual burden” because they didn’t include foregone economic activity, higher consumer prices for financial services, lower returns for shareholders of financial institutions, higher financial expenses for unbanked individuals, and other direct and indirect costs. And what are the offsetting benefits? Can all these costs be justified? Hardly. David and Norbert point out that we’re all paying more and getting very little in return for the higher burdens. The original goal of the BSA/AML rules was to reduce predicate crimes, such as illegal drug distribution, rather than money laundering itself. Judged by this standard, very little empirical evidence suggests that the rules have worked as designed. In fact, even though BSA/AML rules have been expanded consistently throughout the past four decades, it remains difficult to discern any net benefit of the overall BSA/AML regulatory framework. 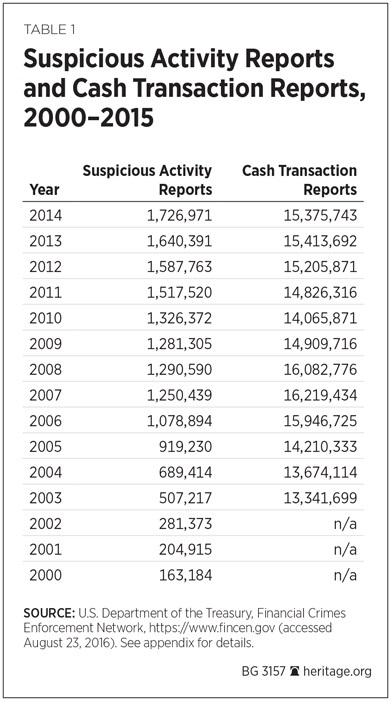 Even though there is no clear evidence that the rules materially reduce crime, the BSA/AML bureaucracy began relentlessly expanding internationally—primarily through the Financial Action Task Force (FATF)—more than two decades ago. One comprehensive study reports that even though the FATF proceeds as if these rules have produced only public benefits, “[t]o date there is no substantial effort by any international organization, including the International Monetary Fund, to assess either the costs or benefits of” this regulatory framework. In fact, BSA/AML regulations have been sharply criticized as a costly, ineffective approach to reducing crime. …compliance costs are high for financial companies, with a disproportionate burden falling on smaller firms…, where hiring even one additional employee can lower the return on assets by more than 20 basis points. Other research suggests that the increasing compliance burden in the banking industry is at least partly responsible for the trend toward consolidation and the disappearance of smaller banks. …an American Bankers Association (ABA) publication highlights a small bank that reports it has to dedicate more than 15 percent of its employees to compliance-related tasks. An ABA survey also suggests that the cumulative cost associated with compliance has caused banks to offer fewer services and raise fees, thus harming consumers. …the BSA/AML regime has been a highly inefficient law enforcement tool. At the very least, a high degree of skepticism about further expansion of these and similar requirements is in order. Given the billions of dollars spent annually by the private sector on the existing elaborate and costly AML bureaucracy, a serious data-driven cost-benefit analysis of the existing system is warranted. If anything, I think they’re being too nice. The cost-benefit analysis already exists. The laws and regulations don’t work. Let’s expand our look at the issue. The Wall Street Journal notes that the current approach has myriad negative consequences as banks sever relationships with customers (in a process called “derisking”) because they don’t want to deal with the hassle, expense, and liability of money-laundering red tape. …financial firms, faced with strict penalties over counterterror and anti-money-laundering rules, have severed accounts of thousands of customers in recent years over fears of heightened risk. The consequences of shuttered accounts were detailed this week in a Wall Street Journal investigation showing how money-transfer firms whose bank accounts have been closed have been pushed out of the global banking system. In addition, nonprofit organizations operating in Syria and Lebanon have faced challenges after losing their bank accounts. …In February of this year, more than 50 nonprofits asked the U.S. Treasury to publicly affirm that nonprofit organizations aren’t inherently high risk. …Two studies by the World Bank in late 2015 found that money-service businesses—which include money transmitters—and foreign banks were both seeing account closures at increasing rates. This process has made life much more difficult for people and businesses seeking to engage in legitimate commerce. Another report from the WSJ explains that the rules actually make it harder for law enforcement to monitor the people who might actually be doing bad things. U.S. banks have closed thousands of accounts held by people and organizations considered suspicious, high-risk or difficult to monitor—including money-transfer firms, foreign banks and nonprofits working abroad. Closing accounts for fear their customers may be up to no good evicts from the financial system the innocent as well as those the U.S. government would most like to watch, a consequence not anticipated by Washington. Comptroller of the Currency Thomas Curry this month acknowledged the potential danger. “Transactions that would have taken place legally and transparently may be driven underground,” he told an international conference of bankers and regulators in Washington. …Fearing steep financial penalties for failing to spot a wayward customer, many banks now shun anyone who looks risky. That leaves ostracized companies to seek alternatives—such as toting bags of cash overseas—a practice that allows hundreds of millions of dollars to leave the global banking system… “The whole flow of money goes underground, and that becomes counterproductive to the original purpose of being able to track” it, said Dilip Ratha, head economist of the World Bank’s unit that studies remittances. “It’s a bit paradoxical.” U.S. officials said they didn’t intend banks to close whole categories of customer accounts. So potential bad guys are harder to track. And financial institutions waste lots of money (which translates into higher costs for consumers). The good news is that some nations are looking to adopt a more rational approach, as evidenced by this Bloomberg report from 2015. Though, as reported by the Times, the U.K. government has a bizarrely inconsistent approach to these issues. Even to the point of threatening to steal people’s property unless they can somehow prove that it was purchased with innocent money. People who amass suspicious quantities of wealth in Britain will be ordered to prove that it was not obtained through corruption, under proposals being considered by the Home Office. New “unexplained wealth orders”, which would reverse the burden of proof to compel the recipient to justify the source of the questionable cash. Here’s a novel idea. Why doesn’t law enforcement engage in actual, old-fashioned police work. In other words, instead of having costly burdens imposed on everybody, governments should use the approach which historically has successfully reduced crime – i.e., policies that increase the likelihood of apprehension and/or severity of punishment. Instead, we actually get politicians and policy makers coming up with schemes to expand the burden of money laundering laws. Some of them want to ban the $100 bill, or perhaps even ban cash entirely. All so government can more closely monitor the private financial choices of innocent people. If you want more information, here’s a video I narrated on this topic for the Center for Freedom and Prosperity. Last but not least, let’s return to the Heritage study, which includes this very important warning about a very risky and dangerous treaty that may be considered by the U.S. Senate. 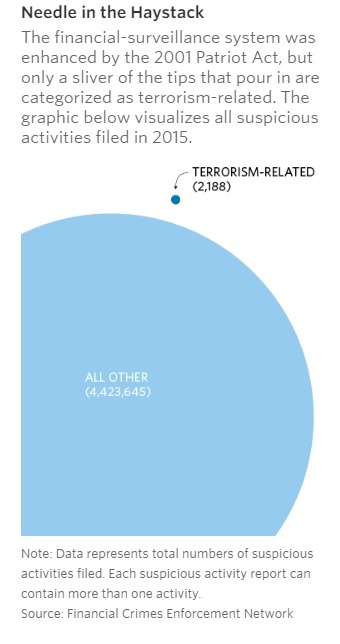 …the willingness to impose costs on the private sector and to violate the privacy interests of ordinary people should be less in the case of information sharing for tax purposes than for the purposes of preventing terrorism or crime. Moreover, tax-information-sharing programs are quite often a veiled attempt to stifle tax competition from low-tax jurisdictions. Tax competition is salutary and limits the degree to which governments can impose unwarranted taxation. …The U.S. Senate is currently considering the “Protocol Amending the Multilateral Convention on Mutual Administrative Assistance in Tax Matters,” which would impose a wide variety of new information-reporting requirements on financial institutions to help foreign governments collect their taxes. A second treaty—worse than this protocol—is the follow-on OECD treaty known as the “Multilateral Competent Authority Agreement on Automatic Exchange of Financial Account Information.” This follow-on treaty implements both the protocol and the 311-page OECD “Standard for Automatic Exchange of Financial Account Information in Tax Matters.” Together, the protocol, the Multilateral Competent Authority Agreement, and the OECD Standard constitute the three main parts of a new automatic information-exchange regime being promoted by the OECD and international tax bureaucrats. If the U.S. ratifies the protocol and implements the new OECD standard, Washington would automatically, and in bulk, ship private financial and tax information—including Social Security and other tax identification numbers—to Argentina, China, Colombia, Indonesia, Kazakhstan, Nigeria, Russia, and nearly 70 other countries. In other words, foreign governments that are hostile to the U.S., corrupt, or have inadequate data safeguards, would automatically have access to private financial (and other) information of some U.S. taxpayers and most foreigners with accounts in the U.S.
A truly awful pact. And keep in mind it also would be the genesis of a World Tax Organization. P.S. Since we closed by discussing the intersection of tax and money laundering, I should point out that statists frequently demagogue against so-called tax havens for supposedly being hotbeds of dirty money, but take a look at this map put together a few years ago by the Institute of Governance and you’ll find only one low-tax jurisdiction among the 28 nations listed. Dan- there is one benefit of this system that you failed to recognize. In putting these regs in place, one of the things they did was to reduce the size of paper money bills. For instance, the thousand dollar bill has gone the way of the buggy whip. Think how much easier it would have been for the Obama administration to get away with transferring payments for hostages had the bills been larger. It would have taken 1/10 of the room. Silver lining…hah. All joking aside, I agree this is a major problem. I was shocked to learn how much information they had on me when I received some large payments in my past. It does the government no good to watch me- I am not going to do anything untoward. So, every moment they spend looking at me is a moment that could be used to follow somebody who was actually doing something bad. I feel the same about the TSA searching 80 year old grandmothers. It takes their attention away from the potential bad guys. I have decided that if I move out the country I would move almost everything at one time, all well planned in advance. Immediately buy real estate, etc because that is legal to have in my name. Of course I have been studying this for 6 years! many low income Americans don’t have bank accounts… in some cases it is a result of high fees… in others… low credit scores prevent them from participating in the banking system… this situation has a serious impact on how the working poor conduct their economic lives… for some payday lenders with their higher fees and interest rates have become a way of life… in effect… poor people are being denied the opportunity to participate in the economy… and use the existing system to improve their lot in life… the same situation exists in banana republics the world over…. in spite of feigned righteous indignation for the fate of the poor… politicians and bureaucrats have little regard for people at the lower end of the economic scale……… except to expend taxpayer money for the purposes of vote buying… and justifying the expanse of government… if indeed the cost of each conviction is approximately $7M… what the hell are we doing it for? perhaps the benefit of global banking institutions……………….. and the related political contributions? but most certainly not for the cost effective prosecution of criminals… . Is it possible that the real reason for the regulations is make financial repression more effective, to fence in the sheep for easier sheering?